So, there I was travelling to Athens, Istanbul then back to Athens. I had various devices with me: My iPhone 5s, A Moto G running Android, iPad Mini and my trusty Mac Book Pro 13″. With varying degrees of internet access and high roaming charges, I soon ran down my mobile phone batteries. The iPad, a brilliant device, just wasn’t up to the heavy music and video-laden PowerPoint I was editing for three presentations, 4 workshops and music downloads over ten days. Each day I would revert to my Mac book Pro. Sliding it form my trusty TUMI bag I rarely had to recharge it from the nightly charge (sometimes not even charging nightly), I placed it on the desk, flipped the lid and instant access. Easily vamping onto the hotel or bars free Wi-Fi I was soon up and running, tweeting, Facebook posts, updating my blog, all whilst my Windows using colleagues struggled to lock into the Wi-Fi signal, let alone get their presentations working. You see, the MacBook Pro is simply a brilliant device. Expensive, yes, but the productivity increase you get for using it over a Windows PC is at least 50% more. Recently I took delivery of a Windows Tablet that our IT team was dishing out to our Australian Sales teams. I had to test some software. First off I set up my various accounts: Google, Facebook, Twitter, Hotmail, iCloud etc. The I needed to download Google Chrome. Once I managed to maintain a stable wi-fi signal (the Tablet kept dropping it) I downloaded Chrome and fired it up. To my amazement it started and post my first search popped up many spam windows offering me discounted goods, various tablets and enough gambling sites to drown my finances. I then went in search of Adaware to remove the hijacking sites form my browser. During the download, which took an hour, I received more and more adds and enough pop-up windows to bury the one window I needed to see. Within seconds of getting this tablet onto the net I was plagued by spam and ad sites. Back to my Mac: No matter where I am, no matter what I am doing, no spam, no ad-sites, no crap. With it’s great illuminated keyboard (the eyes aren’t what they used to be), the retina display, the whisper quiet operation (the Toshiba Tablet has the loudest fan I have ever heard), and flash disk, this is definitely the best laptop around. A productivity inflating wonder there is nothing to touch it available today. If you just want to get on and work seamlessly and not be hampered by a trashy interface (Windows 8), connect seamlessly to any wi-fi network and stay there, simply work on your laptop, then the Apple MacBook Pro 13 is the one to get PERIOD! 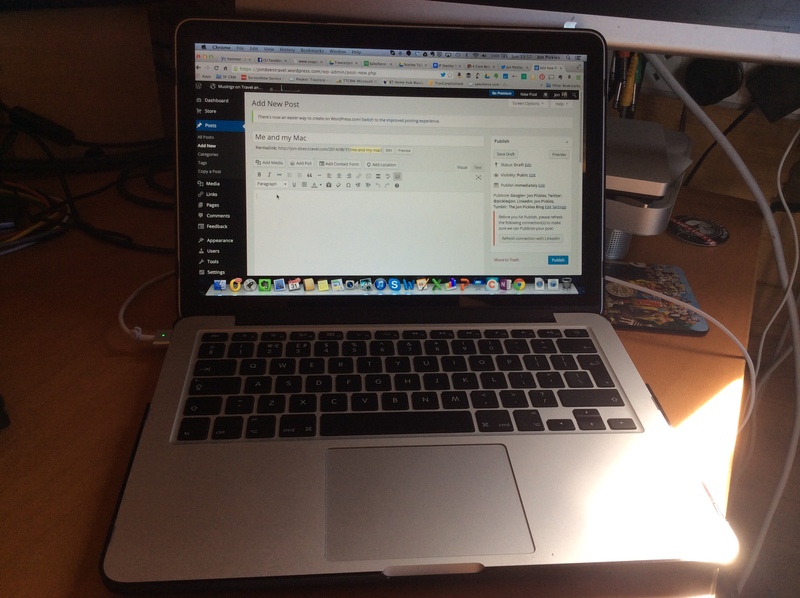 This entry was posted in Apple, inspiration, MacBook Pro, Tech, Travel and tagged apple, Laptop, MacBook Pro, Productivity, Windows 8 on August 31, 2014 by Jon Pickles.